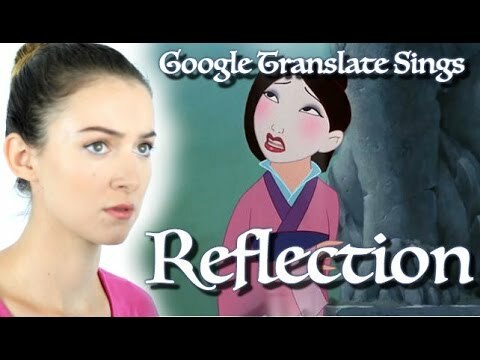 Malinda Kathleen Reese shows what it would be like if "Mulan" were translated from Chinese, in her newest YouTube video. Reese introduces the video by telling how "The Ballad of Mulan" is an ancient Chinese ballad and, therefore, the woman Mulan would have spoken exclusively in Chinese. In the video, Reese sings revised lyrics to a song from the Disney movie, altered to sound like they were translated from Chinese into English or, at the very least, replaced with common synonyms. Some of the most entertaining lyrics include "I will beat Betty heart" and "I cannot hide the sugar, who I was, but I endeavor he was." Some of Reese's other videos include "'Let It Go' according to Google Translate," (8.8 million views) "Google Translate Sings: 'Hello'" (1.5 million views) and "Google Translate Sings: 'Defying Gravity'" (440,000 views). Her "Reflection" video has over 5,000 views.